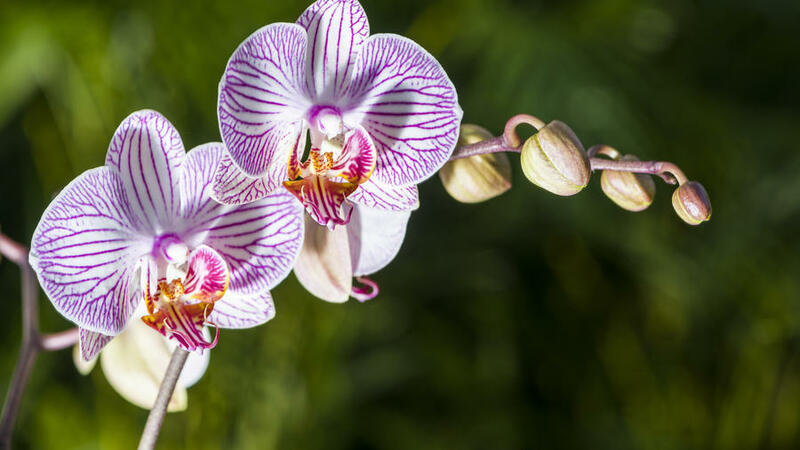 Elegant and delicate, orchids have a mystique all their own. With blooms that last up to four months (and re-bloom for years on end), they make a great hostess gift, houseplant, or replacement for cut flowers. Here are the easiest types to grow indoors. Named for their pouch, lady’s slippers (Paphiopedilum—paph, for short) boast pouch-like blooms from winter through spring. WaterLady’s slippers need more water than the others on this list. The exact amount varies on whether you pot your orchid in sphagnum moss (less often) or large bark (more often). But still be careful not to overwater roots. Lift the container up before and after watering to get a sense of its weight when it’s dry. And when in doubt, wait a day. LightWhile they need more water than the others, paphs require less light. An east-facing window is ideal. Reddish leaves are a sign of too much light. Err on the side of too little while you’re figuring out your paph’s preferences. TemperatureLady’s slippers will be happy in your home (60-65º at night and 75-85º during the day). Remember that temperatures next to windows fluctuate more than the rest of your house. FertilizerUse a balanced orchid fertilizer diluted to 1/4 strength weekly, skipping every fourth week to avoid accumulation of salts. PruningSnip spent blooms down to leaf level. Keep watering and fertilizing, and you should see a new flower stalk within a year. RepottingRepot every 1 to 2 years. And ideal potting medium for Paphiopedilums 4 parts fir bark to 1 part perlite. Smaller fir bark (l/8th to 1/4 inch) is actually preferable to the medium or large chunks used for Cattleya and moth orchids, recommended below. This group includes species and cultivars of Cattleya, Laelia, Rhyncholaelia, Sophronitis, and hybrids. Their flowers are shorter lived, 1 to 4 weeks on the plant, and blooms usually happen between winter and late spring. WaterCattleya orchids like to be the driest among this list of three. They need to be allowed to dry completely before the next watering. The best way to know when the plant is dry is to learn the difference in weight a wet plant (heavy) and dry (light). When in doubt, wait a day or two, and always use lukewarm (not cold) water. LightThis is a light-loving group of orchids. Bright indirect light is still ideal ideal, but you can play around with giving Cattleya more light than less.If leaves are a nice shade of medium green, your plant is getting the right amount of light. Dark green means too much shade, and reddish leaves mean too much sun. TemperatureCattleya orchids will be happy in your home (60-65º at night and 75-85º during the day). Remember that temperatures next to windows fluctuate more than the rest of your house. Repot on occasionNo potting soil allowed! When bark chips have decayed (usually between 1 and 3 years), water your cattleya orchid, jiggle it out of the pot, and wash the old bark from the roots, snipping off any dried or mushy roots with clean clippers. Repot in moistened, medium-grade bark so the base of the bottom leaves sits above the bark and 1/2 an inch below the pot rim. The best time to repot an orchid is after its bloom cycle is over in late spring. With flowers that look like butterflies and last for months at a time, moth orchids (Phalaelnopsis) bloom from winter into late spring. LightAn east-facing window that gets morning light is ideal. South- or west-facing windows work, too, but be sure your orchid is shielded from the brightest (and harshest) of afternoon sun with a sheer curtain. The leaves should be a bright shade of olive green. Darker leaves means the plant is not getting enough light; red-tinged leaves mean there’s too much exposure to light. WaterA once-weekly lukewarm watering is usually enough for Phalaelnopsis. You might need to be a little more frequent in summer, and less so in winter. When in doubt, give it another day. TemperatureMoth orchids are happy in the same temps we are: above 60º at night and between 70º and 80º during the day. Remember: Temperatures on a windowsill are colder or hotter than the rest of your house, and fluctuating temperatures can cause buds to drop off right before they open (causing a huge bummer). Pay close attention that your moth orchid is out of the way of any drafts. FertilizerFeed weekly with a light fertilizer (a teaspoon of 20-20-20 liquid fertilizer to a gallon of water—remember, I’m fine using fertilizers indoors). Once a month, skip the fertilizer and use clean water to flush any excess salts. PruningWhen flowers fade, you have two choices: Cut the spike down to the leaves and the plant will grow a strong stem with even larger flowers within a year. Or you can cut stem just above the first node (it looks like a bump) below the lowest faded bloom. Often the remaining stem will produce another round of flowers within 8 to 12 weeks. Repot on occasionExact same instructions as Cattleya types just above.